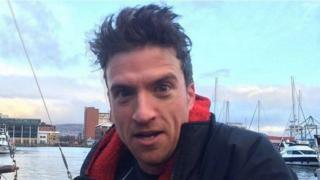 Greg James started his mammoth Gregathlon challenge for Sport Relief in Belfast on Monday. The Radio 1 presenter is aiming to complete five triathlons over five days in five different UK cities - as well as present his daily afternoon show. He kicked it off with an open water swim in Belfast during the Radio 1 Breakfast Show with Nick Grimshaw.